Here at TOKAY we are really into cleats. Join us for a look back at the fascinating history of cleats. Ultimate celebrates its 50th anniversary as a sport this year. And for most of that history, our athletes have been using footwear designed for other sports. This remained the case for the first three decades of the sport, until Brett Price started Gaia in 1998. As founder of first company to design and produce cleats specifically for Ultimate, we consulted with Brett during the research and design of our own TOKAY cleats. Initially he simply advised us against the idea. But once he understood that Robin was truly serious about the project, we talked more at length about the pros, cons, ins and outs of ultimate footwear. Our series on the history of ultimate cleats would be incomplete without an interview with the original ultimate footwear innovator. So without further ado, we present to you: Brett Price! What led you to starting Gaia? And during a time at which playing barefoot was allegedly quite common, what prompted the decision to make cleats for ultimate? I started playing ultimate in 1996 and was immediately hooked. I had recently developed an entrepreneurial spirit and wanted to start my own company. Ultimate was becoming quite mainstream in Vancouver the league was flourishing but no one knew which type of footwear to purchase. I started GAIA in 1998 with a focus to develop ultimate specific footwear along with fully customized apparel and accessories, and to also advocate for the development and growth of the sport. We started sponsoring some of the top club and national teams and through our distribution partner (Jump and Reach, Heiko Kissling) sponsored the 2000 World Ultimate and Guts Championships in Heilbronn. That was a fortuitous tournament as it is also where I met my future wife who was a local spectator (who also started to play ultimate after seeing the event). Playing barefoot on grass was never common, though you would see it from time to time. Ultimate is pretty unique in its stresses on the foot and the human body in general, the quick lateral motion with stops and starts takes a toll on the body and the foot. Our shoes tried to increase performance but also safety and comfort. Ultimate in those days was rarely played on well manicured fields, the grass was long, and there were lots of holes and variability, pretty dangerous actually. These field conditions were quite different than those for soccer/football and so we needed footwear unique to our sport. Much of this rationale continues to exist today. How were the goals to increase player performance, safety and comfort manifested in the design of Gaia’s cleats? This was achieved through longer sharper studs, better support through the midfoot and heel and a 3/4 cut upper that supported the ankle without isolating it. The polyurethane outsole had long and sharp studs. While the stud length was great in long and wet grass, the sharpness meant that they would bite into firm sunbaked ground. We kept our studs round so that they would pivot in the grass and not create a cookie cutter effect where you could blow an ankle or knee on quick directional changes. The upper gave additional support without isolating the ankle…which then puts increased stress on the knee. The midsole and heel counter also had to be super stiff and waterproof to ensure that the shoes don’t degrade in the wet and heat. It is critical though that players dry their shoes out immediately after use…and please remove those insoles to dry the insides too! Good care means the shoes perform better, longer. In your own experience, what is the most important characteristic of cleats you use for Ultimate? And what would you advise people to look for when selecting their cleats for Ultimate? There are a few equally important items. Make sure your shoes fit you well and take care of them. Don’t let them stay wet, and don’t walk on pavement..this will keep the uppers/midsoles strong and supportive and the studs sharp. When the studs get too rounded or the uppers sloppy…time to replace them. Use cleats until their performance degrades, not till they rot off your feet! How did the cleats evolve over the years? We started on the footwear line from the very beginning, though it took many years to get the shoes to something that we were truly proud of. We had 3 models, a top mens, a top womens and a mid market unisex model. We started with the Strike (mens) and Sky (womens). The original ones were leather and super comfortable, but leather stretches and retains water so we moved into synthetic uppers. The Endura was always synthetic but was otherwise the same shoe. Leather was considered premium back then. The G4 was a major advancement, we changed the outsole to our own proprietary outsole that we developed in Italy along with a much stiffer midsole/boardlast and heel counter. The shoes were much stiffer, lighter and didn’t absorb water like the original models. Distribution was a major challenge as e-commerce was still in its early stages and not everyone was as comfortably purchasing footwear online as they are today. Despite this difficulty, Gaia’s cleats did well and people still speak fondly of them to this day. So what led to the decision to end production? We stopped making cleats at the end of 2008. During the credit crisis of 2008 we operationally integrated and were therefore reliant on our primary production facility. The banks called a loan on them which basically took us out. They never gave us any early warning that they were in trouble and so we lost the ability to produce…and consequently our company. These were dark days and a few people lost money due to the somewhat duplicitous actions of this factory. After about 6 months of licking my wounds, I restarted GAIA as a smaller more focused brand. Our new focus has been great for us, the product is as good as it has ever been with over 99% accuracy (i.e. virtually no mistakes) and we haven’t shipped an order late in almost 10 years. Things are going really well these days. When you look back on Gaia’s early history, before rebooting the brand in 2009, what is your biggest takeaway? Biggest lesson. Hmm. Tough one. Certainly focus is important, we used to try and do everything, travel the globe, hit every event, make every product, and market in every way imaginable. Now everything is just easier, and better. It was a wild and fun ride though, lots of experience(s) that I wouldn’t have had if I took the the safe route from the beginning. What were some of your highlights from that early history during which Gaia produced cleats? There were certainly highlights and “lowlights”, the vast majority of players/customers were very reasonable and gave great support to us along our journey. However there were certainly those who had unrealistic expectations on almost everything. They didn’t fully value how hard we ultimate players are on shoes and they expected them to perform well for a decade..when that is not really a reality for any athletic shoe, ultimate or otherwise. We also had several sent back because they “blew out” but when we pulled out the insoles they were literally caked with green mold…a full science experiment. As I mentioned previously, keeping your shoes dry as much as possible is key! There were many highlights though, it’s a great feeling to see your cleats on top players doing amazing things. Lots of personal interactions with players and basically just having fun “talking shop” about the development of a key piece of equipment. What are you up to these days? What new business adventures are you undertaking? GAIA is going strong and we have another brand called Kazoom Cycling, custom cycling apparel for road and moutain bike. Great fit, fabrics and service delivered on time. Check us out! Thanks for the plug. Thank you Brett for taking the time to talk with us about Gaia and its historic cleats! At this point in the development of cleats we have seen the transformation of heavy leather workboots into increasingly lightweight, synthetic and sport specific pieces of performance footwear. Things, namely cleats, were about to get colorful. Initially cleats came in one of two colors: black or brown. But Ultimate would not be Ultimate without a little bit (or way too much) color. The introduction of alternative colors to cleats in the 1970’s can therefore be seen as an exceptionally important development in the history of Ultimate cleats. The first alternative color? A lack of color. In 1970 Alan Ball took to the fields in a pair of white soccer cleats. The white cleats were part of a bid by German brand Hummel to stand out as they tried to gain a stronger share of the UK market. Ironically, for the match in which Ball was to debut Hummel’s white cleats, Hummel was unable to provide Ball with the type of cleats he needed. Therefore Ball could instead be seen wearing his own adidas cleats painted white with Hummel’s chevrons. Despite this deception, the publicity stunt was a success. The game’s commentator made frequent mention of Ball’s atypically colored cleats and numerous close-up shots were provided for the television audience. Hummel’s UK sales doubled the following day, and soon thereafter Hummel provided Alan Ball with genuine white Hummel cleats. Following Hummel’s success, atypical colors slowly found their way onto cleats and finally truly caught on in the mid-90’s as yellow and gold boots made an entrance. In addition to launching (the lack of) color in cleats, Alan Ball was also one of the first players to be used by a manufacturer to promote their brand. For the first time in soccer’s history, individual players were being sponsored by manufacturers, a move that became more commonplace in the 90’s. or display a logo not belonging to the league’s three sanctioned brands. Despite the relative color and design freedom offered by the NFL for both pre-game and in-game cleats, the uniform rules remain restrictive and players are routinely fined for breaking the rules. Soccer currently has no rules regarding cleat color and even appears to have only one rule regarding footwear full-stop: that cleats worn should not be dangerous. Given the vagueness of this rule, leagues have to contend with the pre-game checking by referees of players’ cleats. The boundaries of what is and is not allowed are frequently discussed on internet forums and the conclusion is often to simply ask the league in which the cleats will be worn. Some leagues do not permit metal studs while others have no such policy. Despite what the league may allow, final say rests with the referee who should do a pregame check to ensure that all cleats are safe. Many will only check that no part has become sharp and therefore dangerous to other players, the sharpening of studs being a not uncommon side-effect of players wearing their cleats on concrete surfaces. Ultimate takes a similar stance to soccer with regards to footwear, with limited rules. But while soccer relies on a referee to decide whether a particular pair of cleats may be worn, Ultimate provides a few more details and empowers players to make that decision themselves. At least within the WFDF Rules of Ultimate 2017 Appendix, footwear even seems optional…. Or maybe the line that players “may wear shoes or boots” (WFDF Rules of Ultimate 2017 Appendix v2.1 Appendix C11.1) only gives a choice between shoes or boots. But despite being a footwear company specifically for Ultimate, we prefer the interpretation in which footwear is optional. This document is an additional set of rules to be used during WFDF events on grass, like the World Ultimate Club Championships happening this summer. These rules therefore do not necessarily apply to non-WFDF events. Within the aforementioned Appendix C, the rules concerning (potentially optional) footwear go so far as to specify that studs and ridges may not protrude more than 20mm or have sharp edges. Wonderfully it is specified in Appendix C that “shoes do not need to be matching in any way.” Bring on the rainbow! The Official Annotations serve as a complimentary document to the Rules of Ultimate 2017. The Official Annotations document exists in order to help players correctly interpret the Rules document. Unlike the Appendix discussed above, The WFDF Rules of Ultimate 2017 and the Official Annotations will apply to all games you play that use the WFDF rule set. While no direct mention of footwear is made in the Rules document itself, the Official Annotations do have some useful guidelines to help players determine if their footwear is appropriate. The Official Annotations specify that “[f]ully metallic studs, long studs, and studs with sharp edges are not allowed on footwear.” Presumably long studs are those over 20mm as specified in the Appendix. Something all three of these rule sets aim for is player safety. And while the specifics differ a little bit, they all have the same general message: if your shoes or cleats are dangerous to anyone, you’re not wearing them. All of these three rule sets also place the responsibility for ensuring their footwear rules are followed on the players themselves. The only mention of footwear in the USAU Observer manual and WFDF Game Advisor manual comes in the form of dress code requirements for the officials themselves which are strikingly similar. Both Observers and Game Advisors must wear cleats (turf shoes are cleats). Black of black-based are recommended and for Observers they are required for showcase games. The rule set that comes closest to soccer in terms of equipment checks is the AUDL, but even here the officials are not required to inspect cleats to ensure player safety, they simply may check if they so choose. In line with USAU’s rules, the AUDL specifically calls out baseball cleats and track spikes as footwear that “has the potential to cause injury to an opponent” (3.3 Inspection). They add in golf shoes too, for good measure. In both soccer and Ultimate, the limited rules concerning footwear are in place to protect player safety. And while Ultimate’s player safety discussions will often center on dangerous plays rather than footwear, player safety discussions in soccer cleats do often focus on shoes and studs in particular. Our research yielded two primary topics of concern although they are quite interconnected: stud material and stud shape. As mentioned previously, studs will often sharpen over time due to improper use of cleats, like wearing them on concrete surfaces. But this process can also happen to certain cheaper plastics simply from use on sandier grounds with a few rocks in the soil. High quality sole materials are therefore important to avoid dangerous wear and tear to your studs. In 1996 laminar blades were first introduced to cleats, specifically to the third generation of adidas’ Predator cleats: the Predator Touch. These cleats featured Johnston’s new “Traxion” sole, a hybrid plate that combined traditional studs and blades together. But despite being the man behind bladed studs and hybrid boots, Johnston is also one of the most outspoken voices of concern regarding the safety (or lack thereof) of blades and hybrid cleats. In the limelight of professional soccer there have been a score of incidents where bladed studs caused considerable cuts to opponents. These incidents require stitches and time on the bench for recovery, but there have also been near misses with potentially more serious consequences. In 2012 Wayne Rooney needed 10 stitches after a collision with an opposing player’s cleats. According to doctors had the cut been only a millimeter deeper it would have punctured Rooney’s femoral artery which could have been fatal. As early as 2005, bladed cleats were banned at Manchester United by Sir Alex Ferguson. He did so as a precautionary measure for despite fears that bladed cleats might be dangerous, FIFA insisted they were safe. Johnston and likeminded people argue that with a handful of serious incidents at the professional level, there are countless others at the amateur and youth levels that go unreported. In addition to the sharpness on impact, there are also concerns that hybrid soles and bladed studs might be behind an increase in foot, ankle and knee injuries in soccer players. The concept behind the original introduction of blades was to enable players to turn at higher speed in tight spaces. And while effective, it is now argued that with the high forces at play in athletes’ bodies, it is the weaker parts like the knee ligaments and metatarsals that end up giving out under the pressure as the cleats themselves hold their ground. Some soccer enthusiasts are pushing FIFA to go the way of the Rugby arguing for similarly more specific requirements for player footwear. But while World Rugby does indeed have in-depth regulations concerning the safety aspects of footwear used in the sport, a document they update and change as deemed necessary, blades are not banned in Rugby either. Nor are blades banned in American Football. Both American Football and Rugby have minimum dimension requirements for studs. Provided blades satisfy these dimensions, there currently appears to be no concern in these sporting communities about the use of bladed studs, neither for the harm they could cause the wearer themselves or the injuries they could cause to other players. In fact, especially the Rugby community is far more concerned about the undersized studs common in soccer cleats creeping into their sport. Now granted, Ultimate and Soccer are inherently different and Ultimate has approximately 99% less kicking (we see you, kick spikers). But with countless Ultimate players wearing soccer shoes, concerns over player safety as related to footwear are concerns that the Ultimate community should share. Afterall, accidents happen. Soccer giants adidas and Nike have both indicated a willingness to cooperate with regulations, but unfortunately there are none. Just those two companies together account for roughly 70% of soccer footwear, so their willingness to change would have an incredible impact. Despite many potentially career ending accidents, FIFA has not budged on their earlier assertions that bladed studs are safe. Nike has indicated that there remains a demand, and that they will continue to supply a range of “traction solutions.” Adidas is also aware of the issue, but was not as forthcoming about its plans. We’ve now discussed cleat rules at length, including the rules governing cleats used to play Ultimate. So next time, it is time to introduce some Ultimate cleats! “11th Edition Rules.” USA Ultimate. “History of Soccer Cleats from Past, to Present.” Soccer Maniak. “Law 4: Players’ Clothing.” World Rugby Laws – World Rugby’s Law Education Web Site. “‘Let’s Paint It White!’ | The Origin Of Flashy Football Boots.” Footy Boots, 24 June 2013. “Puma King – Football Boots Vault.” SoccerBible, 21 Mar. 2014. “The Evolution of Football Shoes.” FootballHistory.org. Andres, Matt, et al. “AUDL Rule Book Version 7.0 2018 Season.” The AUDL. Bauman, Jon, et al. “USA Ultimate Observer Manual.” USA Ultimate, Observer Certification Program, May 2016. Connelly, Greg, et al. “WFDF Game Advisor Manual v4.” World Flying Disc Federation, WFDF Ultimate Committee, 3 Mar. 2018. Miller, Nick. “Has a Referee Ever Changed His Mind about a Red Card (Redux)?” The Guardian, Guardian News and Media, 9 Apr. 2014. Sayid, Ruki. “Man U Blade Ban.” Mirror, 4 Feb. 2012. Seitz, Markus, and Klaus Wollny. “Soles.” Football and Technology, Deutsches Patent- Und Markenamt. 22 Feb. 2013. Weiss, Sabrina Rojas. “Super Bowl Trivia: The Cleats.” Footwear News, 29 Jan. 2015. Welty, Matt. “The NFL’s Cleat Policy Is Garbage.” Complex, Complex, 2 Dec. 2016. WFDF Ultimate Rules Sub-Committee, et al. “WFDF Rules of Ultimate 2017 – APPENDIX v2.1.” World Flying Disc Federation, 1 Mar. 2017. WFDF Ultimate Rules Committee. “WFDF Rules of Ultimate 2017 – Official Annotations.” World Flying Disc Federation, 1 Jan. 2017. Although cleats had been around for over 400 years, it was not until the late 1940’s and the end of the Second World War that cleat development truly hit its stride. Post-war design, material, and technological developments revolutionized cleats thus boosting footwear performance further than ever before. Cleat development up until the 1940’s was focused largely on the sole of the shoe. But with the end of World War II upon us, the upper finally got its chance at significant change and improvement. The upper being the part of the shoe on top of the foot. The global nature of soccer was a major factor in the upper’s development. As air travel became more affordable, international matches became more common and the world at large was impressed by the agility and footwork of South America’s players. These players favoured a more slipper-like shoe, a low-top that afforded the wearer more agility than the boot-like cleat still worn in Europe at the time. The design of cleats is always aiming to perfect the trifecta of protection, performance, and style. While the boots of yesteryear definitely provided protection to the wearer, they left a lot to be desired in terms of performance (and arguably also style). As focus shifted to these slipper wearing South American soccer players, the industry’s focus shifted from a protective soccer boot to the agile low-cut. In rugby however, due to the high physicality of the sport, protection remains an important design aspect. Whereas ankle protection in soccer cleats has virtually disappeared, rugby cleats retain their traditional high-level of ankle protection as well as an overall heavier duty construction. Similar to American Football players, rugby players will opt for cleats according to their position, with props and forwards opting for the protection of traditional rugby cleats while those playing attacking positions often opting for the agility offered by soccer cleats. The dawn of low-cut uppers in soccer and even rugby reflects an overall focus from the 1940’s onwards on making all cleats lighter and more flexible in order to make players faster and more agile. Light-weight cleats were largely made possible by material and production developments. Synthetic materials allowed for the entire cleat to be lighter in weight, but also stronger and with improved traction. Remember, earlier cleats were often made entirely out of leather: uppers, soles and studs. While real leather cleats absorb moisture during use and therefore become heavier, water resistant synthetic materials remain light-weight. Therefore, despite the heavy-duty construction of rugby cleats to provide protection to players, a shift to steel and aluminium studs as well as synthetic soles also decreased the weight of rugby boots. In soccer specifically, the shift to synthetics have sped up the sport itself since players and the ball itself are no longer weighed down by heavy and rain or sweat-soaked clothes and cleats. The use of synthetic materials in the sole of cleats was developed from 1954. Nylon was used in the cleats pictured above left worn in the 1958 World Cup. The nylon used in those soles, although light-weight, saw some cracking due to limited flexibility. In order to increase flexibility, material and design changes were made. Nylon was replaced by or mixed with more flexible plastics like polyamide or polyurethane. Structural changes included reinforcing elements and resilient moulded bodies that brought the springy and elastic properties to the sole. Injection moulding techniques adopted in the 1970’s also allowed for the replacement of leather or wooden studs with abrasion resistant synthetic alternatives. Leather was not entirely forsaken however, with the upper of both Adidas’ and Puma’s most popular soccer cleats being made with leather, the 1979 Copa Mundial and 1966 Puma King, or kangaroo leather in the case of the Copa Mundial. Cleat weight hit a new and desirable low with one of young Nike’s first forays into soccer cleat design: 1998’s Nike Mercurial with a weight of only 200 grams. The Nike Mercurial was also the first high-quality cleat designed in synthetic leather. The top (soccer) cleats producers on the market today – Adidas and Nike – both produce high quality cleats with synthetic rather than leather uppers. The industry’s move to lighter designs was not without opposition at first. Some players clung onto their increasingly old-fashioned heavy boots, preferring the additional power in their kicks afforded to them by their heavier soles. Many more players preferred the new lighter cleats, crediting them for being able to run faster and having better ball control. A similar reluctance to change could be seen in American Football. Here, instead of opposing a lighter weight cleat, American Football resisted a change in kicking style which led to a critical change in cleat design. Something American Football, Soccer and Rugby all have in common to a greater or lesser extent is the need to control and kick a ball with your feet. A design requirement that can be tossed out of the window where cleats for Ultimate are concerned, but a design consideration of critical importance to the three other sports. In American Football, players used to kick the ball with their toes in a “straight-on” style and the cleats kickers wore reflected that kicking methodology: the toe of their kicking cleat was squared-off rather than rounded. As soccer started to become better known in the United States, a soccer style kicking methodology started to seep gradually into American Football. Despite widespread skepticism about this new fad, soccer style kickers slowly started to prove themselves over their straight-on kicking counterparts and thus the square-toed kicker shoe also fell out of favor. Straight-on kicking has disappeared from the NFL, but a few straight-on kickers still remain active at a high school and even college level. And those squared-off kicker shoes? Fear not, those too are still available; like The Strider Square-Toe Kicking Shoe pictured below. Naturally soccer cleats also experimented with improved ball control and kicking ability, but their focus was entirely on the upper. Former player Craig Johnston spent a significant chunk of the 1980’s developing an improved sweet spot with which players contact the ball when kicked, initially by attaching ping-pong bat material to the upper of cleats. The results of his prototyping were eventually purchased by adidas and brought onto the market in 1994 in the Predator, a cleat specifically designed to improve power, control, swerve and accuracy. The Predator was fine-tuned repeatedly by adidas over the next two decades and was rebooted just last year, although the sweet spot’s fins have altered significantly in the process. Antoine, the designer with whom we collaborated on the design of our Ultimate specific cleats, was in fact part of the design team of the adidas Predator Accelerator. Those cleats were released for the 1998 World Cup held in France and were worn by French player Zinadine Zidane. Zidane scored twice in the final, helping to secure the host nation’s 3-0 victory over Brazil. Antoine must have been exceptionally pleased when the cleats he helped design won France the World Cup. Despite the success of the Predator in its many iterations and the fact that cleat design can considerably affect the kicking speed and accuracy of cleats, many soccer players do not rank kicking speed and accuracy as important factors in cleat design since many do not realize the impact design can have on these factors. And as far as Ultimate Frisbee is concerned, those aspects are not relevant anyways… moving on! So far within their history, cleats have undergone significant change. Morphing from a heavy leather workboot (those steel capped toes definitely weigh a little something) to an increasingly lightweight, synthetic and sport specific piece of performance footwear. More change was still to come. “Adidas Football Boots.” Adidas Football Boots, Fubra Limited. “Everything You Need to Know about Rugby Boots.” Investec Rugby Academy, 21 Oct. 2016. “Football Boots – History.” Footy Boots, Hedgehog Digital Limited, 9 May 2007. “Football Cleats Buying Guide.” Academy Sports + Outdoors. “Football Square Toe Kicking Shoe.” Prokicker.com. “The History of Soccer Cleats – Part 2.” Golden Shoes Soccer Movie, Norman Koza Production, 14 Oct. 2013. Byrne, Bryan. “The History of the Nike Mercurial Series.” Soccer Cleats 101, 6 Feb. 2018. Fleenor, David. “Short History of the Soccer Cleat.” Soccer365, World Soccer Shop, 20 May 2014. Gallagher, Brenden. “The Surprising and Unexpected Evolution of Football Cleats.” Complex, Complex Media Inc., 13 Sept. 2012. Hennig, Ewald M., and Thorsten Sterzing. “The Influence of Soccer Shoe Design on Playing Performance: a Series of Biomechanical Studies.” Taylor & Francis Online, 7 Apr. 2010.
kknight64. “‘Straight-on’ Kickers and a Little Bit of History.” Reddit: r/nfl, 15 Oct. 2014. Kobin, Daniel. “The Complete History of the adidas Soccer Predator.” SOCCER.COM, 14 Sept. 2017. Seitz, Markus, and Klaus Wollny. “Synthetic Materials” Football and Technology, Deutsches Patent- Und Markenamt. 22 Feb. 2013. Seitz, Markus, and Klaus Wollny. “Football Footwear” Football and Technology, Deutsches Patent- Und Markenamt. 22 Feb. 2013. Simkin, John. 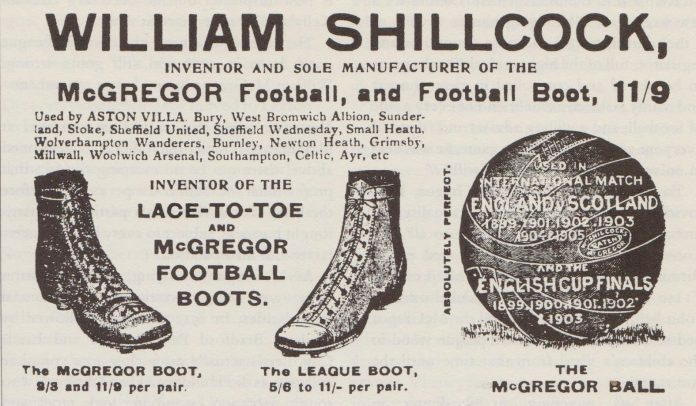 “Football Boots.” Spartacus Educational, Spartacus Educational Publishers Ltd., Aug. 2014. Wisewell, Aaron. The Rugby Coach. Askone International. Here at TOKAY we are really into cleats. As we get closer and closer to releasing our own; join us for a look back at the fascinating history of cleats. As we read in Part 1, the late 19th century saw the introduction of studs to working boots, and their regulation. This development transformed ordinary working boots into cleats. These early cleats, with their above ankle cut and nailed in leather studs, soon left the custody of the cordwainers and the cobbles as brands took over and made cleats a business. The early 20th century introduced us to some of the big names in the sports footwear industry. And although cleats didn’t really change that much in this time, there was a lot of stud specific tinkering in order to develop the replaceable or screw-in stud. Soccer was a popular sport throughout the world wars, and brands we still recognize today (like Gola, Valsport and Hummel) started to come into circulation. Gola, founded back in 1905, even supplied the British Army with army boots (not soccer boots) during WWII. Other soccer and rugby brands like Umbro and Canterbury were founded in the early 20th century, although they would not produce cleats for their respective sports until much later. The Dassler Brothers Shoe Factory, founded in 1920, also produced soccer boots, although it was primarily known for their athletic spikes for sprinting. Dassler’s athletic spikes were worn by none other than Jesse Owens at the Olympic Games in 1936, a big coup for the company. Disagreements between the two brothers brought their collaboration to a premature end. The event that pushed their relationship into irreconcilable differences is widely believed to be Rudolf Dassler being falsely accused of being a member of the SS, since Rudolf believed his brother Adolf was behind the false accusation. The brothers dissolved the company shortly after WWII, but both remained in the soccer cleat business: Rudolf Dassler founded Puma in 1948 and Adolf “Adi” Dassler founded adidas in 1949. Both companies were based in the town of Herzogenaurach where competition between the two brothers kept the town strongly divided. The town even has two soccer teams, one historically sponsored by Puma and one by adidas. Tensions within Herzogenaurach have largely subsided since the deaths of Rudolf and Adolf Dassler in the 1970’s. While there is considerable debate about the first inventor of studs for cleats and boots, adidas is often credited as the first manufacturer of replaceable and interchangeable studs. While untrue, the claim is given credence by the compelling story of Adi Dassler’s involvement in West Germany’s victory over Hungary in the 1954 FIFA World Cup final. Heavy rain during the final made the pitch increasingly slippery. As kit manager of the West German national team, Adi was able to quickly change the team’s adidas screw-in studs during half-time. Changing studs was a process that usually took a considerable amount of time and was usually only done for repair purposes, not to improve grip on muddy terrain. The Hungarians, whose studs could not be so quickly changed, played out the game on short cork studs nailed into place. While this tale is considered the origin story of screw-in studs, such studs had been in development for at least the previous 30 years. There was an earlier German patent in 1925, a French patent in 1924, an American patent in 1922 and a British patent in 1921. The methods of these earlier patents were however usually only meant for repair purposes, and Adi Dassler also improved on these methods with a more firm anchoring of the stud into the shoe, making his design less prone to damage. Meanwhile, in the US, the switch from cobblers to companies was even more strongly marked by the search for interchangeable studs. Here John T. Riddell was credited with the invention of the removable stud. The initial cleats for American football were similar to those used for soccer and rugby. And as Head Football Coach for Evanston Township High School, Riddell often ran into problems with the leather studs of the day. The school was dependant on the same cobbler as Northwestern University for the replacement of studs, and the cobbler was frequently unable to service all of the Evanston Township High School cleats before the start of their games. In the US, the interchanging of studs for other studs better suited to different terrain seems to have been more prevalent than in Europe. And to bypass their dependance on the local cobbler, John T. Riddell invented, or at least developed and patented, a removable cleat stud. The success of these removable football cleats prompted him to start Riddell in 1929, a company currently better known for their helmets. Riddell’s innovations in the field of cleats did not end there. He also developed an “Action Last.” A last is the form, similar in shape to a the human foot, that is used in the production and repair of shoes. 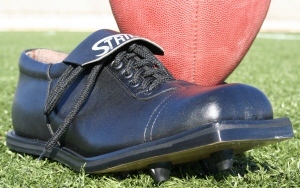 Other American football shoes were usually fabricated using regular street shoe lasts, but Riddell’s “Action Lasts” gave the shoes a more active form. Another innovator of the American football cleat was Joseph Pipal, who also revolutionized the sport itself. In 1913 Pipal introduced the lateral pass to American football. At the time, its ancestor rugby was threatening to replace American football entirely. Pipal’s introduction of the lateral pass, a move common to rugby, is credited by some as saving the young sport. Later, in the 1930’s, Pipal introduced the mud cleat: a cleat with longer and pointier studs better suited to…. muddy conditions. The early days of cleat development were mainly focused on the sole of the shoes and the studs themselves. The leather upper saw very little development in the first half of the 20th century, but from the 1950’s onward, an increased focus on performance would transform cleats in their entirety. Bang, Anna. “Gola | Born In Britain.” Volt Café, Volt Magazine, 14 June 2013. Burwell, Fred. “Fridays with Fred: Beloiter Invents the Lateral Pass.” The Terrarium, Beloit College, 27 Sept. 2013. “Dassler Brothers Shoe Factory.” The Herzogenaurach Story, 30 Mar. 2015. Riddell, John Tate. Athletic Shoe. 12 Oct. 1926. Seitz, Markus, and Klaus Wollny. “Studs.” Football and Technology, Deutsches Patent- Und Markenamt, 29 Feb. 2016. “The History of Soccer Cleats – Part 1.” Golden Shoes Soccer Movie, Norman Koza Production, 11 Oct. 2013. Woods, Jerry. “John Tate Riddell.” Genealogy.com, 10 Dec. 2006. The first record of cleats (or boots) came in 1526 with the order of “football boots” for none other than King Henry VIII’s Great Wardrobe. They were made by the king’s cordwainer (shoemaker) Cornelius Johnson for the sum of 4 shillings, roughly £ 100 / $ 200 in today’s money. Football at the time was a very violent sport, potentially involving hundreds of players per team. 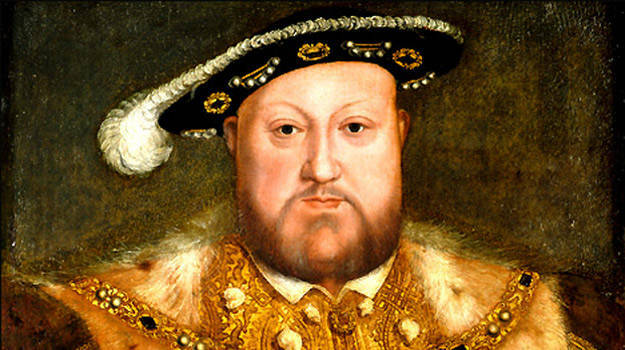 Many monarchs had attempted to ban it previously, and Henry VIII himself followed suit in 1540. Football remained a popular game however, and by the early 1800’s it was gradually evolving into the sports of soccer and rugby as we would recognize them today (although the cleats…. not so much). In the 1800’s rugby and soccer players would usually wear their work boots or walking boots. They came to above the ankles and tended to include a steel capped toe. Such boots were not designed for running or kicking as they were very rigid and heavy, and they were often enhanced with metal plates or nails to increase grip on terrain. Such enhancements were also commonly used for “hacking-over,” a practice of violently kicking the shins and legs of opponents. In rugby, shoes began to be regulated in 1845 with the first codification of the rules. These rules limited cleat materials to leather, rubber and plastic thereby eliminating metal plates and nails. Players would however still get their cleats sharpened for hacking purposes. The practice of hacking was finally banned in 1871 when the Rugby Football Union was formed. By the late 19th century, specific rugby boots were in circulation. Very similar to their walking boot predecessors with their above ankle height, they were improved with 6 leather studs for grip: four under the forefoot, two under the heel. These early cleats were arduous to maintain, needing to be washed and dried after games. Newspapers were often stuffed into boots, to draw out the moisture while allowing the shoes to retain their shape. A practice many players today still employ after a particularly wet outing, or would if only they received a newspaper. Despite this deficiency, rugby boots did not change much until the 1950’s. Rules regulating soccer cleats were first introduced by the Football Association (of England) upon its founding in 1863. The rule in question, number 13, banned all boots with “projecting nails, iron plates or gutta percha on the soles.” Despite this ban, 1886 saw the first introduction of studs into the sport, such as the Ellis patent boot studs pictured in an advertisement below predating their adoption in sports. Soccer specific boots were first designed at the end of the 19th century. Made of thick leather, these boots came to over the ankle and weighed 500 grams each (and double that when weighed down by water after a wet game). While leather studs became the norm in soccer, cleats with bars were in circulation until at least the middle of the 20th century. Such studs and bars were nailed onto the sole but could break off. As illustrated by the pair of shoes from the 1920’s, cleats would be endlessly mended instead of replaced. Because studs were nailed in place, replacements would often need to be in a slightly different position and holes left by old nails were a common feature of well worn cleats. Nailed studs were therefore seldom changed, only if a replacement stud was required. The impracticality of this method led to the search for more easily replaceable studs. Chaudhary, Vivek. “Who’s the fat bloke in the number eight shirt?” The Guardian, Guardian News and Media, 17 Feb. 2004. “Development of the Boot.” Rugby Relics, World Rugby Museum. Ellis advertisement. Illustrated Sporting and Dramatic News, April 26th 1884. Mortimer, Gavin. 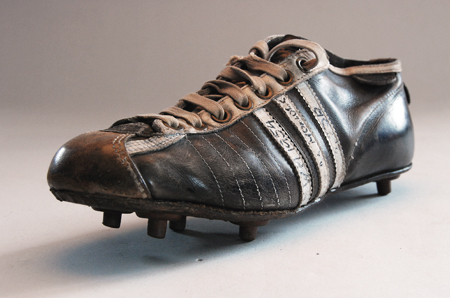 “Pair of old boots.” A History of Football in 100 Objects. Serpent’s Tail, 2012. Risolo, Donn. “History.” Soccer Stories: Anecdotes, Oddities, Lore, and Amazing Feats, University of Nebraska Press, 2010. Roberts, Bryan, and Nigel Trueman. “Apparel.” Rugby Football History. Trueman, Nigel. “Origins of Rugby.” Rugby Football History.